Let’s not indulge in sentiments. Roger Federer fully deserved his record-equalling seventh Wimbledon Grand Slam. The 30-year-old defeated Andy Murray 4-6 7-5 6-3 6-4 on Centre Court to match Pete Sampras’ achievement and climb back to the number one position in the world. Once again, Murray ends up as a bridesmaid. His bid to win his first even Grand Slam, backed by the massive support of his compatriots fell short, as he found Federer in an unforgiving mood. The 25-year-old Scot now shares his coach Ivan Lendl’s unenviable record of losing his first four Grand Slam finals. “Everybody always talks about the pressure of playing at Wimbledon, but it’s not the people watching – they make it incredible,” a tearful Murray said. You cannot discount the support he got from all of Britain, but sometimes, it can be poisoned chalice, doing more harm than good. Having said that, let’s take a moment to sympathise with Murray. He stepped onto the court with every bravery he could muster. And he showed his intent early on, as he took the first set. However, the inevitable set in. 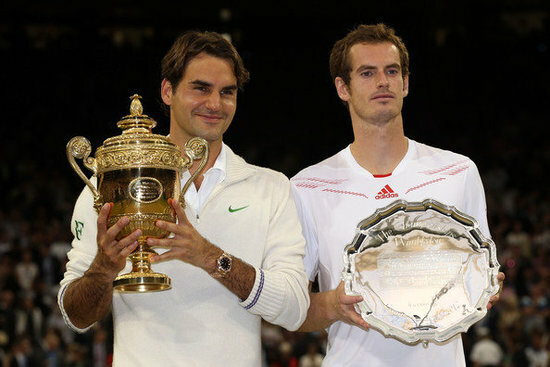 As soon as Federer settled into the game, he pummelled him into submission and claimed his first Grand Slam title since the 2010 Australian Open. “This fortnight was a step in the right direction. I won’t go back on the court until my mind is right and I am over the loss,” Murray said. Yes, he stands every chance of ending up in the first three positions, when the medals are handed out in the Olympics. But if there’s any man who stands a chance of landing the ultimate prize, which will also being staged at the All England Club, it is the Swiss master.